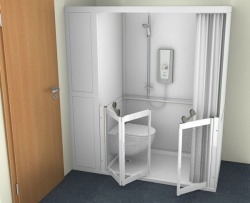 We offer a large selection of Self Contained Free Standing Disabled Shower Cubicles which can be easily installed into almost any room. We have a selection of Low Level & Step-in shower tray options available. Quick and easy to install and remove without the need for expensive property alterations (Installation usually within 2 hours). A cost effective, short term or semi permanent alternative to a traditional adaptation. Easy to get in to, choose from level access, 40mm high or up to 110mm high to suit unbreakable floors that cannot be breached. 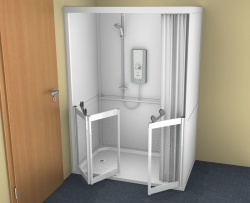 Half height doors for when assisted bathing is required. Shower tray incorporates antibacterial product protection which actively inhibits the growth of harmful and odour causing bacteria, see inside cover. The addition of grabrails, shower seat, WC or a wash hand basin will provide a functional solution for individual requirements. 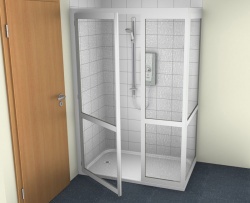 There are many sizes of shower trays available along with a variety of door / shower enclosure cubicle configurations. Most options are also available with a toilet built in if required. 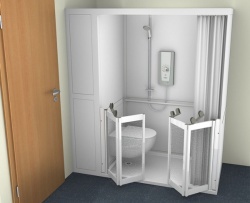 A shower cubicle is the simple option when a showering solution is required with the minimum amount of installation and disruption to existing services. 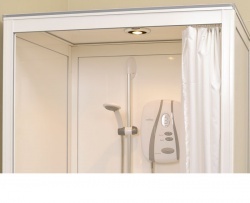 A shower cubicle can be located up or down stairs. 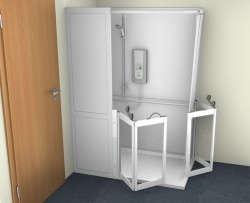 Full disabled cubicles require no tiling, so they can be easily relocated if required. 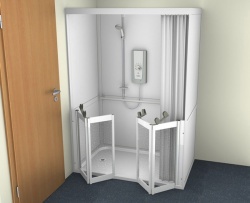 The addition of grab-rails, shower seat or a wash hand basin will provide a functional shower cubicle solution for individual requirements. 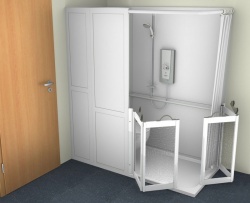 Please contact us if you need any assistance or additional information regarding any of the Self Contained Shower Cubicles.